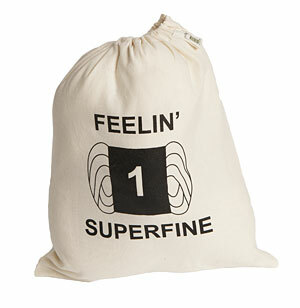 Gracefully tote projects without wear-and-tear in these 100% organic cotton drawstring bags - the absolute perfect size for socks and other accessories; also terrific as an inspired wrapper for gifting! 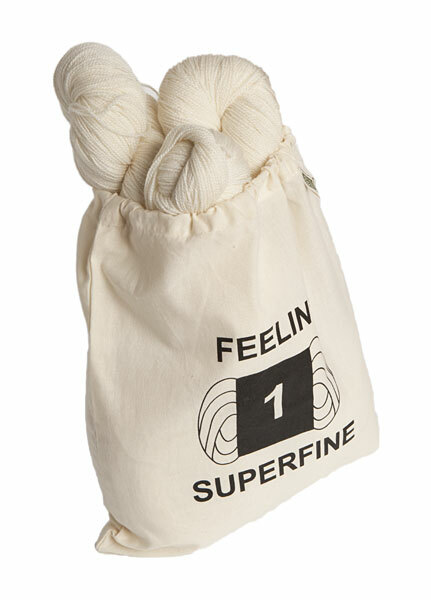 Available in pun-tastic "Superfine" or sweet "Yarn Kitten" designs. I was expecting something more canvas-y, but this is just a plain cotton bag. It's super cute and will fit small projects just fine. I actually am able to fit a nearly-finished shawl and half-skein of yarn. Love the design. My bad for not reading the dimensions but this bag is SMALL. I suppose it fits the design but definitely not for large projects. You could fit a hat or some socks in here, for reference. I love this bag. It folds down to fit perfectly in my purse and is an excellent way to transport my projects. It holds a good amount of yarn and project (more than I ever have on the go) and is so puntastic how can you resist? Must buy!! !